We also promote maximum safety and security. Protect your property with the best locksmith tips. The best ideas coming straight from experienced pros. Locks are useful in keeping your home secured. Have a daily routine of checking the locks on the doors and windows at night before you go to bed. Remember the individuals who have copies of your keys. Make sure to leave them only to people you trust. If you happen to have broken locks, call “Locksmith Fontana” to provide an immediate solution to your problem. Having a guard dog may also be a good option. Guard dogs have been excellent in doing their jobs since time immemorial. Check out reputable businesses with a good track record when buying your dog. But having a dog entails a whole lot of responsibility, so if you can’t take care of them properly, you have to rely on reliable security systems. It's good to install good security door locks at the front entrance of your house but don't forget that back doors, windows, garage doors and any other entry point of your home must be well-secured, too. Intruders would choose the easiest and darkest entrance. The experts of our locksmith company in Fontana insist on deadbolt installation for higher security. Though, it won't make a great difference if your door is hinged to the frame from the outer part. Hinges must be inside the house and secured with 3-inch screws. When keys start getting distorted, they won't fit well in the lock. Eventually, they'll have a difficult time turning or being inserted into the keyhole. Our specialists recommend replacing them before the problem begin since they will lead you to a house lockout and compromise home security. 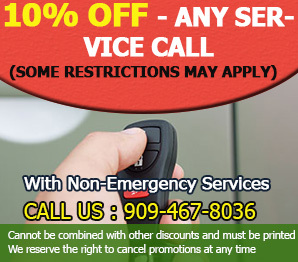 It is ideal that you find an expert locksmith that will provide you with professional key replacement when you need it. Keys wear out and need to be replaced as soon as they show off signs of falling flat in unlocking your home or vehicle. They must be kept properly sharp for your convenience.